Fill in your details below and we will let you know within 24 hours if we can get Santa Maria to you with haste! Always wanted to lead your own colony? 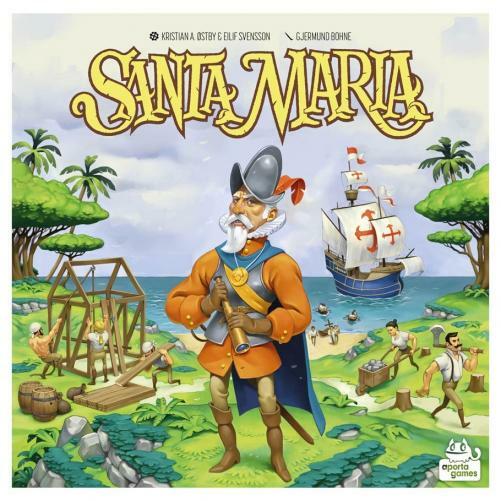 Santa Maria is a streamlined, medium complexity euro-game in which each player establish and develop a colony. The game features elements of dice drafting and strategic engine building. The game is low on luck, has no direct destructive player conflict, and all components are language independent. You expand your colony by placing tetris-like pieces with buildings on your colony board. Dice (representing migrant workers) are used to activate buildings: Each die activates a complete row or column of buildings in your colony. The buildings are activated in order (left to right / top to bottom), and the die is then placed on the last activated building to block this space. It is therefore crucial where you put new buildings in your colony, and also the order in which you use the dice. You will produce resources, form shipping routes, send out conquistadors, and improve your religious power to recruit monks. Each recruited monk may be trained either as a scholar (for special abilities), as missionaries (for immediate rewards), or be appointed as a bishop (for possible end-game points). The player who have accumulated the most happiness after three rounds, wins the game. The available specialists, bishops and buildings varies from game to game, which makes for near endless replayability.